See story on the work being done at Alderworks in the June 3, 2015 Juneau Empire/Capital City Weekly. Hear about Alderworks in Dave White’s CBC-Yukon Airplay interview with Jeff Brady on July 8, 2015: Click here! 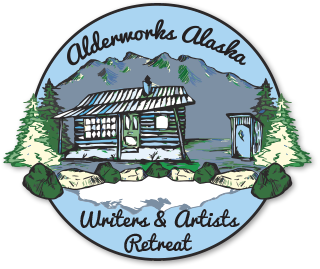 Read the post about how Alderworks Alaska is using the quiet power of Dyea to inspire writer and artists on 49 Writers. See two photo features from The Skagway News in August 2016 from an Open House at Alderworks with Bea cabin resident Liesl Ravenscroft and Mary Jane cabin resident Kathryn Kain. Read about Michael and Kathy Gates’ fall 2014 experience in the Bea cabin at Alderworks in the Sept 26, 2014 Yukon News.